My grandparents used to have a condo in Michigan where they’d escape to every summer. It was on a small, quiet lake in a small, quiet town two-and-a-half hours north of Chicago. There was a tiny kitchen, a dining room, a patio, and two bedrooms, one only large enough to hold a set of twin beds. They bought it before the lake became a popular destination, before you had to be wealthy to live on the water, before large condos were built with granite counter tops and air conditioning. My family made the trek up a few times a year. My siblings and I spent the days swimming in the cold water, collecting sea weed, and covering ourselves in sand. At night the adults would grill chicken and corn on the cob and I would get Kraft Mac’n’Cheese. The TV had about seven channels and had to be changed using a knob, but we weren’t allowed to watch TV, because we were on vacation and we don’t watch TV on vacation, Al. When we were very lucky we got to drive down to the video store in town to choose one VHS to watch, and we almost always chose Wayne’s World. This is my ideal version of summer- lakes and ceiling fans and corn on the cob and memorizing movies. And Michigan Peaches. Michigan Peaches were the ones my grandparents would bring by the sackful. They were ripe and floral and sweet, just waiting to be bitten so they could explode with juice over my arms and shirt. 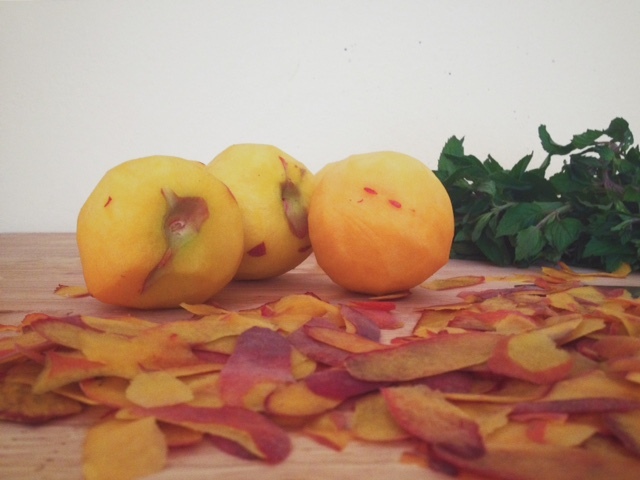 Michigan Peaches were the height of summer, the best possible idea of what fruit could be. They were effortless perfection, a barometer to measure all other other peaches against. Of course I took them for granted. Now perfect peaches are not easy to find. The peaches I find in the store are often hard and unlovable. They are not the perfect embodiment of summer. 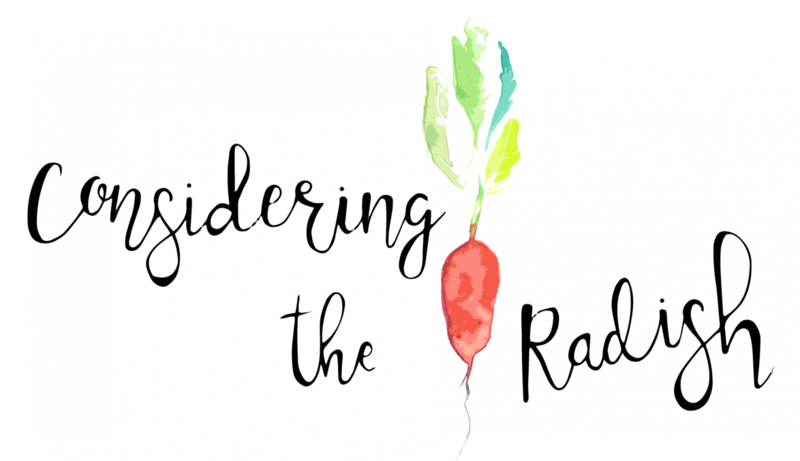 Despite what I want, and so many cookbooks and blogs promise, our produce isn’t always perfectly ripe. Sometimes our fruits and vegetable need some help, which is fair. I need help to be my best sometimes too. 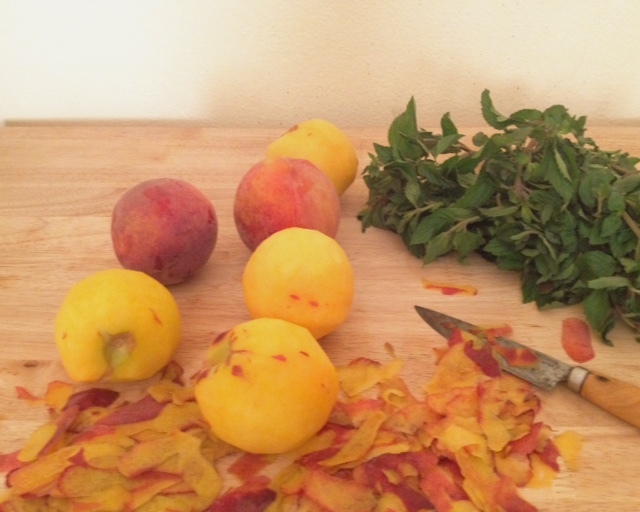 I pulled together this peach salad after I volunteered to bring a salad to am indoor picnic and started leafing through Genius Recipes for ideas. 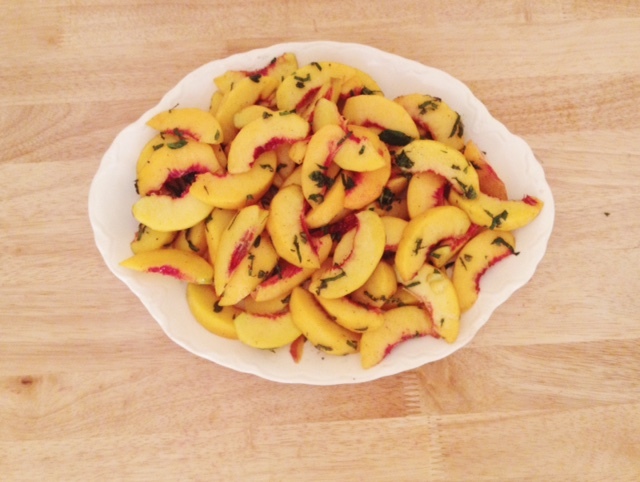 This peach salad is fast, easy, and damn good. The sugar sweetens the peaches and helps them behave more like their best self, while the salt and pepper steer the peaches away from being too sweet. We ate the peaches on bread smeared with brie and licked our fingers in between bites. And even though the peaches weren’t perfect Michigan Peaches they still were summer incarnate. I added the lime juice to this recipe for some brightness. It also keeps the peaches from running too sweet. You could leave out the lime juice and pepper and decrease the salt and turn it into a lovely dessert with some ice cream. Next time I make these I’ll be adding some shallots and thinly sliced Fresno peppers for a savory twist. 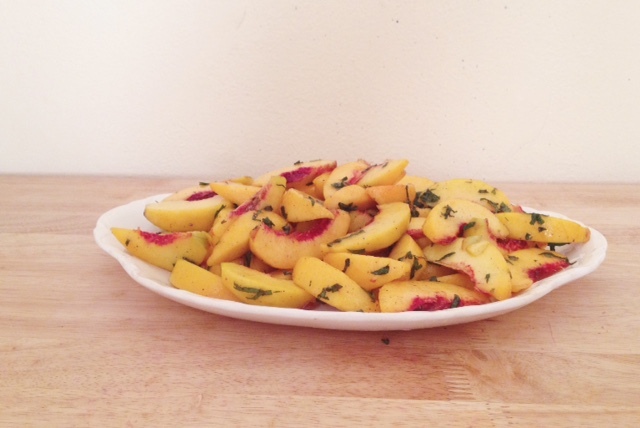 Peel the peaches and slice into wedges. It’s easiest to pull the wedges off as you slice them- there’s less struggling with the pit that way. Toss the peach segments in a medium bowl with the sugar and salt, and let sit undisturbed for ten minutes. Add in the pepper, oil, lime juice, and mint and stir well to combine. You can serve right away at room temperature, or store it in the refrigerator to serve cold later. The longer you wait the softer the peaches get. I found them perfect after about three hours of sitting. Miglore warns that the peaches will become mushy if they are kept overnight. I ate them for breakfast the next morning and still enjoyed them, but wouldn’t keep them much longer. I say winter is my favorite season. I love sweaters and snow and having a built in excuse for hot chocolate with weekend breakfasts. I love the quiet stillness of the streets and the muted quality of the light. One of my favorite things about living in the Midwest is having four distinct seasons, but winter is always tops in my book. And then summer comes along. I start chugging iced tea and eating watermelon for dinner. I live in floaty skirts and sandals and sweat when I go outside. Aaron and I take long naps in the early evening and the sun is still shining when we wake up. There are outdoor concerts to attend and picnics to have and beaches to lay on while grumbling about tourists. And while I would never dream of allowing summer to replace winter in my heart, I have to admit that I routinely underestimate summer. 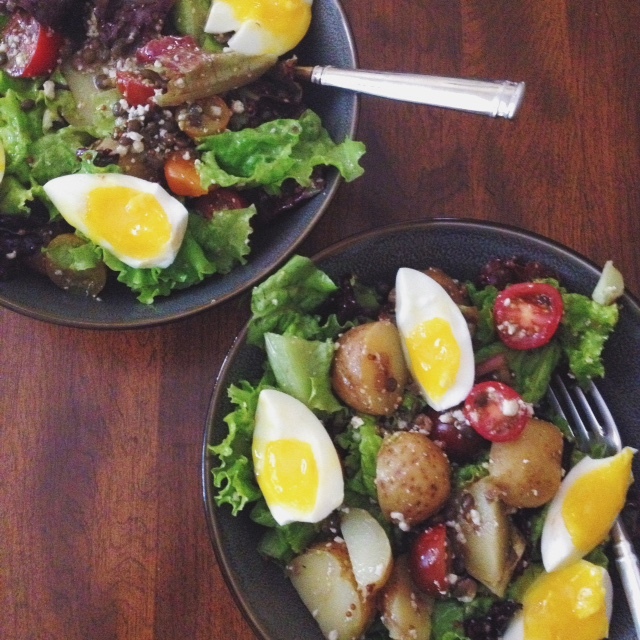 This salad is for the hot days, the lazy days, when you feel languid and still. This salad is for the days where you want something filling but still light. It’s best suited as a prequel for popsicles and a nap in the sun, but I can attest that it’s still completely satisfying if you have to work after eating. Completely. Many of the components of this salad can all be made ahead of time, and in fact I would recommend doing so. I like to boil new potatoes when I find them so I can reheat them whenever I’m hungry. Similarly, I almost always have a tupperware full of these lentils, ready to be added to salads, grains, and pastas. If you do not have the same level of lentil love, you could absolutely leave them out. I would not recommend leaving out the potatoes. Heat the oil in a large pot over medium. Add the garlic, and let saute until fragrant- about a minute. Combine with the red pepper flakes, herbs de provence, bay leaf, and salt. Saute, stirring occasionally, until the garlic starts to brown. Add the lentils, and stir until all are coated in oil. Add 4 cups of water, bring to a boil, and then simmer until tender, between 20-40 minutes. Store in its broth. Put a large pot on the stove with cold water and add the new potatoes. If you have more than half a dozen, you may as well cook them all now. Lightly salt the water and bring it to a boil. The potatoes will be done when you can, without resistance, insert a knife in and slide it out of a potato. Drain and set aside. Set a small pot to boil. When the water is boiling, add the eggs and set a timer for exactly seven minutes. Once seven minutes have passed, drain the pot and run the eggs under cool water. Peel, and set aside. Meanwhile, mix the vinegar, oil, and mustard. Taste, and adjust the seasonings to your preference. Slice half a dozen new potatoes into quarters. In a large bowl combine the lettuce, tomatoes, potatoes, lentils, and cotija. Toss with the dressing. Quarter the eggs, sprinkle with salt, place them on the salad, and eat. She said this angrily. She said this staring at everyone in the room in turn, daring us to contradict her. She hung this mantra, decorated with daisies, in the staff room and bathroom. She did not smile upon seeing us in the morning. She did not celebrate any victories. She demanded good moods and good cheer, while belittling her staff. She was not my boss for very long. She was soon replaced, for a myriad of reasons, by a woman who was eminently competent and eminently kind. Boss #2 never made any demands upon my mood but I was happier at work than I had been at any boss.When it became clear to me that I was in the wrong field I was flooded with deep melancholy. I enjoyed my work, was reasonably skilled at my job, and Boss #2 was the best I had ever worked under. I recently saw the movie “Inside Out”, and I’ve been turning it over in my head ever since. I had expected to fall in love with the movie, but I didn’t. It didn’t have the whimsical delight of “Ratatouille”, or the emotional sucker punch of “Up”. It wasn’t as beautifully animated as “Brave”. When I walked out of the theater I would have given it a B, maybe a B minus. But the film’s message won’t leave my head- that sadness is essential for growth, that the impulse to always be happy no matter what can be damaging, and that our anger, fear, and disgust are all useful tools as long as we control them. Today was a good day. And that good day included the frustration of driving through downtown traffic with a deadline. It included the meditative monotony of pulling weeds in my community garden plot. It included the grief-and-gratitude touched sadness of using a pie dish that I inherited from my uncle. It had short tempers and impatience and kindness from strangers and beer with friends. It was a good day. I am grateful for today. And there is no shame in hardship. This crumble is the perfect size for a nine inch pie dish, and makes a generous amount of topping. If you like a scant amount, then a half recipe should be perfect. The fruit combination can vary in any way you like, just aim for around 4 cups. The small amount of sugar makes a lightly sweetened crumble, which I prefer. If you like a very sweet dessert, you can amp up the sugar. Conversely, if you do not use rhubarb, you may not need any sugar at all. Preheat the oven to 350. In a bowl combine the fruit and the sugar. Stir to combine. In another bowl mix together the spelt four, oats, brown sugar, spices, and salt. Cut the butter into the flour mixture, using either two knives or your own hands, until the butter is in pieces smaller than peas. The crumble should just hold together when it is squeezed into a ball- if it doesn’t, make sure the butter is small enough and evenly incorporated. Turn the fruit out into a nine inch pie dish. Cover the fruit with the crumble topping to your preference- I enjoy a lot of crumble topping, and so I heap it on generously. Sprinkle the walnuts over the crumble. Bake for 35-45 minutes, or until the topping is golden, the walnuts smell toasted, and the fruit is bubbling. Serve warm or room temperature.